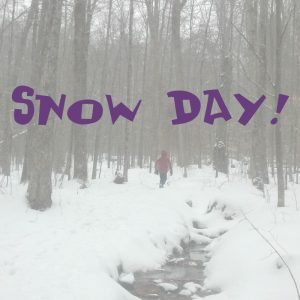 Following Keene Valley Central School’s lead in cancelling after-school activities today, Wednesday, March 7th, we are cancelling the 3:30pm Little Kids Yoga class and the 5:30pm Gentle Yoga Sampler class in our Keene Valley studio today. The Little Kids Yoga session will be extended by one week to make up the missed class. 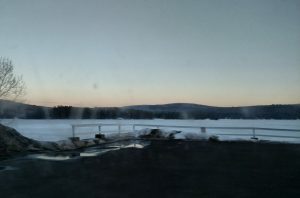 We are waiting to see what conditions are like in the morning in Schroon Lake and Keene Valley (and what the schools do) before announcing any cancellations for our Thursday classes. Please check back in the morning before venturing out for a class. We are happy to announce additions to our yoga class schedules in both locations beginning March 1, 2018. 5:30pm Yin Yoga with Jennifer S.
To keep our classes as accessible as possible, we have not changed our prices since 2012. Unfortunately, our rent and other overhead costs have increased more than we can absorb and we must increase our class prices to be able to keep bringing yoga and other wellness practices to our Adirondack communities. To support our fixed-income seniors, senior citizens (65+) can continue to purchase class cards for $50. There is no senior discount for drop-ins. Our class cards never expire, so you are welcome to purchase extra cards at the current price anytime before March 1st. 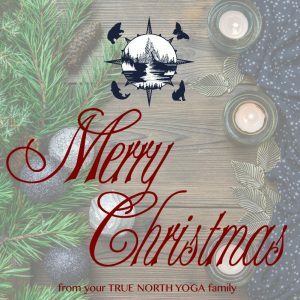 Thank you for your continued presence and support for True North Yoga. This winter’s temperatures so far have bounced between “too warm for winter” and “too cold for me and the pipes,” and rain has alternated with snow leaving a thick layer of ice on places like my driveway. The political and social climate in the United States has been equally inconsistent and icy lately. Yet here we are at the middle of winter and there is reason to hope. Can you feel into that? We may be gathering in protest, in celebration, or for a big football game, but we are gathering. We are leaving our homes, risking icy spots, to declare that we still have hope and winter won’t beat us. We also gather at the yoga studio. In addition to yoga classes, where we connect through the shared practice, we gather for events such as our drum circles and Reiki shares, goddess circles and Red Tent temples. Yoga teachers gather for teacher trainings to advance their own practices and to become better instructors for you. We do our best, working around winter weather when necessary, to keep our opportunites to gather going all year. I appreciate everyone who braves the cold and snow to gather with me. You bring me hope. 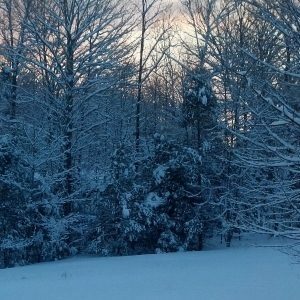 More snow is on its way. Perhaps the second half of winter will bring us opportunities to enjoy the outdoors as well as coming together on our yoga mats. Check out our yoga class schedule for chances to gather and our home page for upcoming events. At True North Yoga, we’ve been bringing you our best offerings of asana (poses) and meditation. Those are only part of the yoga path, however. We are happy to introduce Bhakti Yoga to our studio family and bring you a new way to experience yoga. Bhakti, which is Sanskirt for intense love or devotion, includes practices like prayer, mantra, and – our favorite! – chanting. 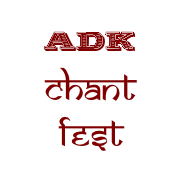 Chanting is shared through the practice of Kirtan, during which chants are lead in a call-and-response format. Traditional Kirtan chants repeat names of the Hindu deities in Sanskrit, but many contemporary kirtan artists blend English-language chants and those from other cultures into the Bhatki experience. Read more about Bhakti practices on Yoga International’s website. For the last six months, Beth and Debbie have been developing their own Bhakti prpactices. With their guitars, they have been practicing chants and they are ready to bring Kirtan to the broader community. On Saturday, February 3rd, as drumming winds down in our Sacred Drumming Circle in the Schroon Lake studio, Beth and Debbie will be offering a “pop-up” community kirtan. We will chant for about 45 minutes and there will be no charge. Look for more of these informal kirtan events in the future in both studio locations. If you’d like to deepen into the Bhakti practice, block off Saturday, April 7th on your calendar. We are hosting the Adirondack Chat Fest in our Keene Valley studio from 10:00am to 10:00pm. We are bringing together a number of Kirtan artists and sound healers for a full day of chanting, singing bowls, and sound baths. More details and tickets are coming very soon. Watch our home page for event information. Most of the great teachers we have at True North Yoga were part of Debbie’s yoga teacher training program. Debbie has trained 32 Adirondack yoga teachers since her initial 200-hour teacher training in 2012. 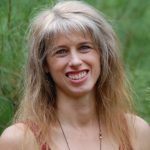 She prides herself on not only giving trainees a firm foundation in yoga asana and philosophy, but in also giving them a strong connection to the magic of our Adirondack park. Because they can share that connection in their yoga classes, our studio more than just a place to practice yoga. It is truly a reflection of the beauty of the lakes and mountains that our part of our lives. The Energetics of Yoga Teacher Training Foundational program includes eleven weekends between October and March. With time to integrate the practices and teaching skills, you will finish ready to teach your first class. Interested in a deeper practice or becoming a yoga teacher? Our next 200-hour, foundational training begins in October. Beginning in 2017, yoga teachers were offered a way to evolve on their mats and in their lives. The Energetics of Yoga Advanced Training program for yoga teachers consists of four “elemental” modules, each taking place over four weekends at our Keene Valley studio. 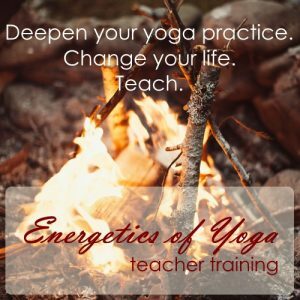 Debbie incorporates shamanic journeys and other experiential practices into the teacher training modules so yoga teachers can awaken and expand personally and professionally. The Earth module focuses on the physical aspects of an asana practice. The program includes a deepening of anatomical awareness, assisting and adjusting asanas, and mapping challenging asanas to introduce them in an accessible and safe way. The Air module wakes up your inner storyteller. Through discussion of the power of story and learning styles, yoga teachers grow more confident in incorporating story into their classes and workshops. The Air module also includes advanced pranayama and a dive into your personal story. Yoga teachers finish with a completed bio ready for promotional materials. In the Water module, yoga teachers explore the subtle body in yoga and the joyful practice of Bhakti. During this module you will do lots of chanting! You will gain a deeper understanding of the chakras, the meridians, and energy practices which compliment yoga. After an introduction to Yin Yoga you will be able to incorporate Yin poses into your classes for more variety and to address energetic as well as physical imbalances. During the Fire module, you will discover your passions. A weekend is devoted to an eye-opening look at the various social and environmental issues that exist around the world and your own core values. You will approach teaching as an expression of your unique inner fire. You will advance your sequencing skills to create magical flows and design transformative workshops and private offerings. Each module is offered once a year. Teachers can take any modules of interest in any order. More information, the upcoming dates for each advanced teacher training module, and online registration is available on Debbie’s website. You can also learn more about the six-month, 200-hour Foundational Training program and register for the next session which begins in October. You will also find the dates on our Keene Valley studio calendar. 10:00am Community Yoga with Jennifer M.
10:00am Community Yoga with Jennifer V.
Our regular schedule resumes on Tuesday, January 2nd. Have a wonderful holiday week! 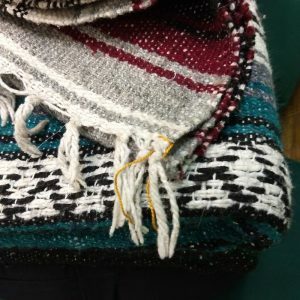 Have you found a yoga blanket in our Schroon Lake studio with a gold thread tied in the fringe? If so, you have a newley washed blanket thanks to the Seva of Helene Vanderburgh, a regular and long-time supporter of our studio. Seva means “selfless service” in Sanskrit, the traditional language of yoga. Helene has been washing our blankets two at a time, week after week, so they are fresh and clean for us, and for you. We are very grateful to Helene for her service, for which she expected nothing in return. Being of service doesn’t have to be difficult. Helene saw a need we had and found a simple, mundane way to meet it. That doesn’t make her service any less meaningful for us. MindBodyGreen shared Ram Dass’ thoughts on Seva, which we think sums up Helene’s work perfectly. Next time you see Helene in our Schroon Lake studio, join us in thanking her for washing our blankets. We appreciate all the help we get from our community, which includes very simple things like inviting your friends to a yoga class or event, taking the time to put your props away neatly for the next class, and taking off your shoes before you walk on the floor to keep it clean for all of our socks and bare feet. We thank you, too!